Tonight the skies will clear late. It will be breezy and in the upper 30s. Tomorrow it will be sunny, in the low-to-mid 50s. Sunday there will be a quick shower, but otherwise there will be more afternoon sun. Temps will be in the mid-50s. Despite clouds and occasional showers on Friday, temperatures will still manage to reach the 50s and 60s across New England. The front triggering the occasional showers will depart this evening, eventually resulting in a clearing trend overnight. Lows on Saturday morning will land in the 30s for many as that happens. A new air mass starts to work in on Saturday, bringing with it sunshine and highs in the 50s. Another disturbance will swing into New England Saturday night and very early on Sunday morning, though. That will bring a few more clouds during that time, and even a few snow showers in the mountains of Northern New England. 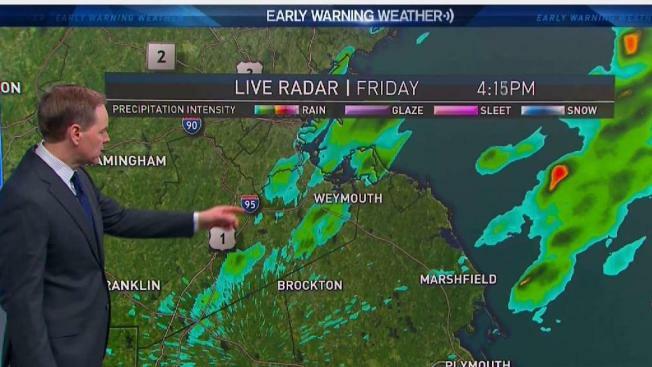 In Southern New England there may be a shower before and just around dawn on Easter, but the vast majority of towns will stay totally dry. Over the course of Easter, sunshine will become more widespread as that system pulls out. Highs will reach the 40s and 50s. Next week will be active, with a series of storms making close passes to New England. It will also be cooler, meaning highs will reach the 40s to around 50 on most days. The first storm to watch is Monday. While most of it, for now, appears to miss to our south, it’s close enough that it needs to be monitored. Yet another system arrives Tuesday and Wednesday. That will bring a much better chance of rain showers. At this moment Thursday, which is the Red Sox home opener at Fenway Park, looks bright and dry. Another risk of showers arrives after that, on Friday and then again into the next week. When patterns are fast moving like they will be next week, the timing often changes a bit, so check back as we get closer for more specifics.